A complete tempory guide frame system to hold and support a panel of steel piles whilst they are installed. Guide walings are incorporated at two levels to provide precise guidance and support. Upper walings are designed as personnel walkways in accordance with current regulations, end trestles provide safe personnel access and full structural support. The system readily transports as one load and can be quickly assembled on site using proprietary connectors. Working panel lengths of either 12 or 24 m (40´ or 80´) can be accommodated with upper wailings at either 4 or 6 m (13´ or 20´). BOX GIRDER CONSTRUCTION PROVIDES IMMENSELY STIFF LATERAL SUPPORT TO THE SHEET PILES. NEGLIGIBLE DEFLECTION OCCURS EVEN WITH LONG PILES (e.g. 20 METRES). 750MM WIDE WALKWAYS PROVIDE A SPACIOUS WORKING PLATFORM. GUARDRAILS ENABLE OPERATIVES TO WORK WITH BOTH HANDS WITHOUT FEAR OF FALLING. STRESSED AND SLEEVED WIRE CONSTRUCTION IS RESILIENT TO DAMAGE FROM SHEET PILES. THE PRE-CAMBERED WAILING SHEDS WATER AND OIL SPILLAGE FROM EQUIPMENT. NON-SLIP UPPER SKIN PROVIDES A SAFE WORKING ENVIRONMENT. TOE BOARDS ARE INCORPORATED INTO THE CONSTRUCTION OF THE WAILING. LIFTING POINTS ARE PROVIDED, RECESSED TO PREVENT A TRIPPING HAZARD. HOOK BOLTS AND CROSS MEMBERS ARE PROVIDED FOR THE “FIRST GATE” OR FOR THE INDIVIDUAL H, BOX OR PIPE PILE INSTALLATION. “T” BRACKET FOR ‘TRAILING END’ WALING SUPPORT IS ALSO PROVIDED. PURPOSE MADE SUPPORT STRUCTURE FOR TOP AND BOTTOM WALINGS. 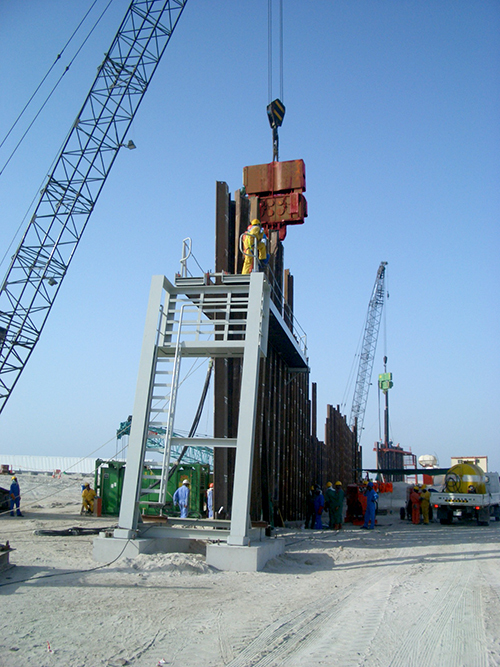 INCORPORATES A SAFE WORKING AREA FOR POSITIONING THE TOP WALINGS (this occurs twice in every panel of piles). DISMANTLES SIMPLY FOR COMPACT STACKING, CHEAP AND EASY TRANSPORT. SPECIAL CLAMPS LOCK THE WAILINGS IN POSITION. MANY SMALL DETAILS ARE INCORPORATED AS A RESULT OF YEARS OF PRACTICAL PILING EXPERIENCE. ALL REQUIREMENTS OF THE FACTORIES ACT HAVE BEEN BUILT INTO THIS EQUIPMENT.